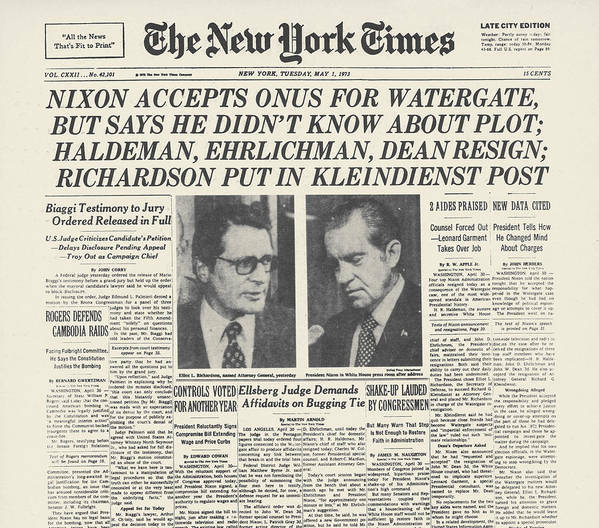 The souvenir 'We were right about Nixon' tee shirt promotion has paid off big. The company added 109,000 new digital-only subscriptions in the second quarter. As a result, the newspaper ended the quarter with a 2.89 million digital-only subscriptions and 3.8 million subscriptions as a whole, including readers who receive only the print edition. Since late 2016, when Donald Trump shocked the US establishment by winning the US presidency, the Times has enjoyed a period of rapid growth, acquiring around one million new subscribers. "We'll soon pass three million digital-only subscribers and four million total subscribers," Mark Thompson, president and chief executive officer, told a conference call with investors, on Wednesday. But the market has seen digital subscription growth slow, with a net gain of 139,000 readers in the first quarter of 2018, compared to 157,000 new digital-only subscriptions in the last quarter of 2017. Thompson countered that the net additions were "still much higher" than typically achieved in the second quarter since the launch of the pay model. Another reason, he said, for the slowdown was the Times' decision to reduce marketing spent on Facebook due to a dispute with the social network which is currently in the process of being resolved. Subscription income accounted for 62.8 percent of revenue in the second quarter, compared to 50.5 percent five years ago, an increase that has partially offset a decline in advertising income, the company said. Subscription revenue was up 4.2 percent year-on-year, while advertising revenue was down 9.9 percent. Second-quarter digital advertising revenue decreased 7.5 percent, while total revenue increased to $414.6 million, a growth of 4.2 percent year-on-year. Net profit was $23.6 million, up 51 percent mainly due to a lower outlay on severance costs compared to the same quarter in 2017. So far they have failed. Dumbf is still in the White House. The NYT and WaPo are exceptions to the norm. They control their advertising rates and are profitable even with subscription increases. Those two are the big boys. Most newspapers utilize SAU to determine ad rates. In that model a 75k paper in Pennsylvania charges the same as a 75k paper in New Mexico. The are done in groupings (aka <25k, 26k-50k, 51k-75k, etc..). However the gape gets larger as the circulation numbers increase. So it may be 250k-500k. At that point a 499k circulation is less profitable than a 251k circulation. One of my papers business gurus explained it to me as the newsroom was celebrating becoming the largest paper in the SE United States. He was not nearly as excited as we were. He essentially said ever new subscription diminished our revenue stream. So growth does not always mean success. No, they succeeded in PUTTING Dumbf in the WH. The data from 538 is compelling. And the NYT is now playing ball with the Far Right just to appease 45. Washington Post seems far more comprehensive and sticking to their guns. Just like you did, both by nominating and breathlessly supporting, a candidate so fundamentally flawed, corrupt and scandal-ridden that she would lose to a has-been reality TV star,,,. Haven't been round here in a while, can you elaborate on how they're playing ball with Far Right? Do you have a preferred site that you read that covers the news and what they're doing right, and wrong? Poynter, or fivethirtyeight or ? I'd like to see the article/s on all this, I am sincerely interested....I will send them a letter and tell them to stop cozying up. Thanks. I read the Times almost daily, but try to maintain a careful eye...remembering they were largely responsible for getting us into the Iraq II with their fake WMD reporting. I also subscribe to WaPo but their coverage is often so shrill that I have to take it in small doses, aka "Trump Sneezed Today, How Offensive"...and this from someone who leans pretty far left on a lot of issues. I read the NY Times every day - they are NOT helping Trump. They are on his backside everyday. "Playing ball with the far right??" They did do that stupid article some time ago about "the white supremacist at home he's just a normal guy like you" but they apologized a million times for that since. Otherwise - I don't see any support of Trump, at all. The Times is usually ahead of WaPo in anything related to the Russia investigation, for example. Your posts are so repetitive and without merit that I am beginning to think that you are a troll that wasn't bright enough to get Putin to pay you to do this. A predictable response to you'all's constant and repetitive one subject obsession. And the beauty of it all is that you are responsible for his election.